The bright and colorful 1967 Topps baseball card set is a favorite of Dean’s Cards collectors. The cards are pure – there are no distracting designs, and that serves to emphasize the beautiful photographs throughout the set. 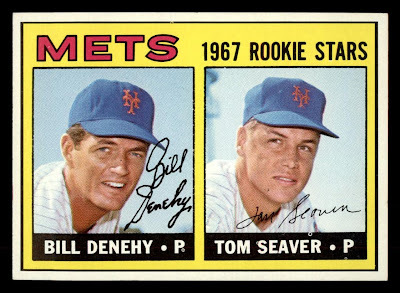 1967 Topps Tom Seaver rookie card available at Dean's Cards. Without a doubt, the rookie cards are one of the best features of the 1967 Topps baseball card set. The 1967 Topps baseball card set has several key rookie cards. Card #569 Rod Carew and #581 Tom Seaver are part of the high number series, so both can be very difficult to find. 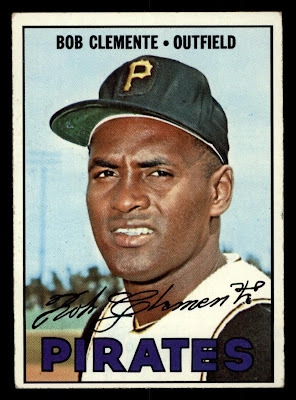 Roberto "Bob" Clemente card from the 1967 Topps set at Dean's Cards. The 1967 Topps set is one of the most difficult to complete due to the high number seventh series, which consists of cards #534-609. The high number series was not released in all parts of the country, was short printed, and was released at a time when the football season was just starting. These three factors make it very difficult to find any seventh series cards. If you asked Dean’s Cards collectors to name their favorite 1960s baseball card set, many would quickly name the 1967 Topps baseball card set. The set is fun to collect and challenging at the same time. When you combine the simple, beautiful design, the high quality photographs, the great rookie cards, and the challenge of collecting the seventh series, the 1967 Topps baseball card set really does offer something unique feature for every type of baseball card collector. 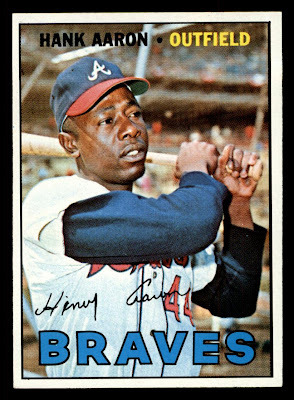 Hank Aaron from the 1967 Topps set available at Dean's Cards. • Subsets: World Series highlights (151-155) and league leaders (233-244). • Key rookie cards: #569 Rod Carew and #581 Tom Seaver.